The Prime Minister of Lithuania (Lithuanian: Ministras Pirmininkas, literally translated as Minister-Chairman) is the head of the Government of Lithuania. The prime minister is Lithuania's head of government and is appointed by the President with the assent of the Lithuanian parliament, the Seimas. The modern office of Prime Minister was established in 1990, during the turmoil surrounding the Soviet Union's collapse, although the official title was "Chairperson of the Council of Ministers" until 25 November 1992. Historically, the title of Prime Minister was also used between 1918 and 1940. This was during the original Republic of Lithuania, which lasted from the collapse of the Russian Empire until the country's annexation by the Soviet Union. Legislative elections to the Seimas are held every four years at most and newly elected Seimas approves the Prime Minister. No term limits are imposed on the office. Following the ultimatum in June 1940, the forces of Soviet Union entered Lithuania, prompting President Antanas Smetona to flee the country. Antanas Merkys, who assumed the position of acting President in accordance with the constitution, soon announced he had taken over the Presidency on a permanent basis and appointed Justas Paleckis, favored by the Soviet authorities, as the Prime Minister ahead of the "people's government". Merkys soon resigned, allowing Paleckis to assume the post of acting President as well. The presidency of Merkys is not recognized as legitimate in modern Lithuania and Paleckis is not listed as an interwar Prime Minister in government sources. From 11 March 1990 after adopting the Act of the Re-Establishment of the State of Lithuania. ^ Term of office starts when the Prime Minister is appointed by presidential decree and starts forming the government. Term of office ends when the Prime Minister or the government is dismissed or their resignation is accepted by presidential decree. Term of office does not include the time served in an acting capacity, typically until the next Prime Minister forms a new government. ^ a b "Ankstesnės Vyriausybės. Laikotarpiu 1918-1940". Government of the Republic of Lithuania. Retrieved 9 May 2016. ^ Senn, Alfred Erich (2007). Lithuania 1940: Revolution from Above. Rodopi. pp. 147–148. ISBN 9789042022256. Retrieved 9 May 2016. ^ "History". President of the Republic of Lithuania. Retrieved 9 May 2016. ^ "Ankstesnės Vyriausybės. Po 1990 metų". Government of the Republic of Lithuania. Retrieved 29 April 2016. ^ "DĖL LIETUVOS RESPUBLIKOS VYRIAUSYBĖS GRĄŽINAMŲ ĮGALIOJIMŲ PRIĖMIMO IR PAVEDIMO JAI EITI PAREIGAS". Seimas of the Republic of Lithuania. Retrieved 29 April 2016. ^ "DĖL LIETUVOS RESPUBLIKOS VYRIAUSYBĖS GRĄŽINAMŲ ĮGALIOJIMŲ PRIĖMIMO IR PAVEDIMO LAIKINAI EITI PAREIGAS". 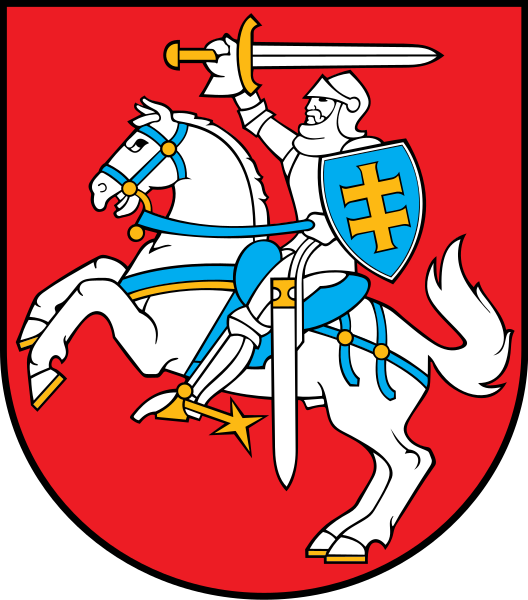 Seimas of the Republic of Lithuania. Retrieved 29 April 2016. ^ "DĖL LIETUVOS RESPUBLIKOS VYRIAUSYBĖS GRĄŽINAMŲ ĮGALIOJIMŲ PRIĖMIMO IR PAVEDIMO JAI LAIKINAI EITI PAREIGAS". Seimas of the Republic of Lithuania. Retrieved 13 May 2016. ^ "DELFI ŽINIOSDIENOS NAUJIENOSLIETUVOJE D. Grybauskaitė premjeru paskyrė S. Skvernelį". Delfi.lt. BNS. Retrieved 22 November 2016. Albertas Šimėnas (born February 17, 1950) was Prime Minister of Lithuania for 3 days, from January 10 to January 13, 1991. He disappeared during the January Events and was replaced by Gediminas Vagnorius. Šimėnas graduated from the Vilnius University in 1972 with a degree in economics. He lectured at the Vilnius Gediminas Technical University from 1984 to 1989. He joined activities of Sąjūdis movement and was elected to the Supreme Council – Reconstituent Seimas. On March 11, 1990, he signed the Act of the Re-Establishment of the State of Lithuania, declaring Lithuania's independence from the Soviet Union. In January 1991, when the first government led by Kazimira Prunskienė resigned due to rising prices, Šimėnas became the Prime Minister of a largely unchanged government. However, as the Soviet Army entered Vilnius and surrounded key buildings, Šimėnas disappeared. In an emergency session, Gediminas Vagnorius took over his cabinet and became the Prime Minister. Šimėnas suddenly reappeared on January 14. He joined Vagnorius' government as the Minister of Economy on May 30, 1991, and served until the government resigned on July 21, 1992. In 1994, he joined the Lithuanian Christian Democratic Party and was elected to the Seventh Seimas in 1996. He ran unsuccessfully in the 2004 Seimas and European Parliament elections, after which he joined the private sector. Šimėnas published several academic papers on economy and a monograph about economic reforms in Lithuania from 1990 to 1994. Algirdas Butkevičius (born 19 November 1958) is a former Prime Minister of Lithuania, serving between 2012 and 2016. He also served as the Minister of Finance from 2004 to 2005 and the Minister of Transport and Communications from 2006 to 2008. He has led the Social Democratic Party of Lithuania since 2009. Andrius Kubilius (born 8 December 1956) is a Lithuanian politician who was Prime Minister of Lithuania from 1999 to 2000 and again from 2008 to 2012. He was leader of the conservative political party Homeland Union – Lithuanian Christian Democrats. Antakalnis (lit. 'the place on hills') (Pol. Antokol) is an eldership in the Vilnius city municipality, Lithuania. Antakalnis is one of the oldest historical suburbs of Vilnius City. It is located in the eastern section of Vilnius, along the left bank of the Neris River, with the river running along the whole western side of the district. The Antakalnis eldership is the second largest in Vilnius, with an area of 77.2 km². One of the greatest Lithuanian Baroque masterpieces, the Roman Catholic Church of St. Peter and St. Paul, is situated in Antakalnis, as is Sapieha Palace (Sapiegų rūmai). Sapieha Palace is surrounded by the only surviving Baroque-style park in Lithuania, which contains the oldest linden tree in Vilnius. Antakalnis is home to the historically important Antakalnis Cemetery, where victims of the January Events in 1991, killed by the Soviet Army, are buried; their graves are often visited, as they are considered national heroes of Lithuania. The Antakalnis eldership includes the favourite recreational area and prestigious cottage district Valakampiai, where two river beaches have been established. The current and former President of Lithuania, the Prime Minister of Lithuania, and other state officials reside in the Turniškės neighborhood of Antakalnis. The Botanical Garden of Vilnius University lies in Kairėnai, the settlement in the eastern part of the district. The Jewish surnames Antokolec, Antokolsky and variants derive from the Polish form of the name of the city, Antokol. Antanas Tumėnas (13 May 1880 in Kurkliečiai, near Rokiškis – 8 February 1946 in Bachmanning, Austria) was a Lithuanian politician, teacher, professor of law, judge, Prime Minister of Lithuania in the 10th cabinet, Chairman of the Supreme Committee for the Liberation of Lithuania. He was a member of the Lithuanian Christian Democratic Party. Tumėnas was elected to the Constituent Assembly of Lithuania and was appointed as chairman of the Constitutional Commission of Lithuania (1922). Later he was a member of the 1st Seimas. He participated in creating the law system of the new republic. He was Minister of Justice in the 9th, 10th and 11th Cabinets of Lithuania. Bronislovas Lubys (8 October 1938 – 23 October 2011) was a Lithuanian entrepreneur, former Prime Minister of Lithuania, signatory of the Act of the Re-Establishment of the State of Lithuania, and businessman. Lubys was born in Plungė. He was CEO and main shareholder of the Lithuanian company Achema. As of August 2008, he was the richest Lithuanian, according to the Lithuanian magazine Veidas.Lubys died of a heart attack while riding a bicycle in Druskininkai on 23 October 2011. Ernestas Galvanauskas (November 20, 1882 – July 24, 1967) was a Lithuanian engineer, politician and one of the founders of the Peasant Union (which later merged with the Lithuanian Popular Peasants' Union). He also served twice as Prime Minister of Lithuania. Eugenijus Gentvilas (born 14 March 1960 in Telšiai) is a Lithuanian politician, signatory of the Act of the Re-Establishment of the State of Lithuania and Member of the European Parliament for the Liberal and Centre Union (Liberal Movement since 2006), sitting with the Alliance of Liberals and Democrats for Europe. He was mayor of Klaipėda from 1997 to 2001. In mid-2001, Gentvilas briefly acted as Prime Minister of Lithuania. Gediminas Kirkilas (pronunciation , born 30 August 1951) is a Lithuanian politician who was Prime Minister of Lithuania from 2006 to 2008. He was confirmed by the Seimas on 4 July 2006 after Zigmantas Balčytis, the provisional Prime Minister, failed to gather the required support from the parliament. He stepped down on 27 November 2008 after the 2008 parliamentary elections, and gave way to Andrius Kubilius to start his term as the prime minister. Gediminas Vagnorius (born 10 June 1957) is a Lithuanian politician and signatory of the Act of the Re-Establishment of the State of Lithuania. He served as the Prime Minister of Lithuania, heading the government between 1991 and 1992, and again from 1996 until 1999. After Lithuania regained its independence in 1990, its temporary currency, the Lithuanian talonas, was popularly known as vagnorkė or vagnorėlis after Vagnorius' name. Irena Degutienė (born 1 June 1949 in Šiauliai, Lithuanian SSR, Soviet Union) is a Lithuanian politician and member of the conservative Homeland Union, currently Deputy Speaker of Seimas. She was twice the acting Prime Minister of Lithuania, first from 4 May 1999 to 18 May 1999 and then from 27 October 1999 to 3 November 1999. She has also been the Minister for Social Security and Labour from 1996 to 2000. In 1978, she graduated from Vilnius University with a degree in medicine. For almost twenty years, she worked in Vilnius Red Cross Hospital before becoming a secretary in the Ministry of Health in 1994. In 1996, she was elected to Seimas and re-elected in 2000. On 15 September 2009 Irena Degutienė became Speaker of Seimas, a position she held until 14 September 2012. She is the first woman to hold such position in Lithuania's history. Juozas Tūbelis (April 9, 1882 in Ilgalaukis, Kovno Governorate – September 30, 1939, Kaunas) was a Lithuanian politician, Prime Minister and member and chairman of the Lithuanian Nationalists Union. In 1908, he graduated from Polytechnical Institute in Riga receiving a diploma in agronomy. Not being able to find employment in his field, for another two years he worked in Riga as a teacher and then on land exploitation projects. In 1915, he was drafted to the Russian army. He was able to assist Lithuanian Central Relief Committee which helped out refugees and others suffering from war. He traveled across Russia and in 1918 he returned to Lithuania, and worked for the Council of Lithuania at an education commission. On November 11, 1918, Tūbelis became Minister of Agriculture and State Treasures. On March 12, 1919 he had to resign from the post but became Minister of Education till June 19, 1920. From May 3, 1927 he was Minister of Finances. He held this position until March 24, 1938. On September 23, 1929 he became the Prime Minister of Lithuania. He led three Minister Cabinets (the 14th, 15th and 16th) before resigning on March 24, 1938. Tūbelis was the longest standing Prime Minister of Lithuania. From March 1938 until December 5, 1938 he was Minister of Agriculture. He was also directing the Bank of Lithuania in 1938-1939. Between political roles, Tūbelis helped to establish and direct large enterprises like Lietūkis (est. in 1923), Maistas (est. in 1925), and Pienocentras (est. in 1926). After the coup d'état in 1926, his brother-in-law Antanas Smetona became the president. Since the two men agreed on political views, Tūbelis became the second most powerful man in Lithuania in the 1930s. He is credited for stable economy, national currency litas, and small foreign debt despite the Great Depression. Laurynas Mindaugas Stankevičius (10 August 1935 – 17 March 2017) was a Lithuanian economist and politician who served as the 7th Prime Minister of Lithuania from February to November 1996. He previously served as the Minister of Social Security and Labour from 1993 to 1994, and after being prime minister, was a member of the Seimas from 1996 to 1998, and later Minister of Health from 1998 to 1999. Formerly a member of the Communist Party of Lithuania, following independence he joined the newly formed Democratic Labour Party. Pranas Dovydaitis pronunciation (2 December 1886 in Runkiai – 4 November 1942 in Sverdlovsk, RSFSR) was a Lithuanian politician, Prime Minister of Lithuania, teacher, encyclopedist, editor, and professor. Rolandas Paksas ([rɔˈɫɐ̂ˑndɐs ˈpaːksɐs] (listen); born 10 June 1956) is a Lithuanian politician who was President of Lithuania from 2003 to 2004. He was previously Prime Minister of Lithuania in 1999 and again from 2000 to 2001, and he also served as Mayor of Vilnius from 1997 to 1999 and again from 2000 to 2001. He has led Order and Justice from 2004 to 2016 and has been a Member of the European Parliament since 2009. A national aerobatics champion in the 1980s, after the collapse of the Soviet Union, Paksas founded a construction company, Restako. In 1997, he was elected to Vilnius City Council for the centre-right Homeland Union and became mayor. In May 1999, Paksas was appointed Prime Minister, but resigned five months later after a disagreement over privatisation. Paksas joined the Liberal Union of Lithuania (LLS) in 2000. The LLS won the 2000 election, and Paksas became PM again, but he left within seven months after another dispute over economic reforms. Romualdas Ozolas (31 January 1939 – 6 April 2015) was a Lithuanian politician, activist, writer and pedagogue who taught at Vilnius University. He was a member of the Lithuanian branch of the Communist Party of the Soviet Union from 1973 to 1990, and a member of the Lithuanian independence movement, Sąjūdis from 1988 to 1990. In 1988, he founded the cultural Vilnija organisation. From 1990 to 1991 he served as Deputy Prime Minister of Lithuania together with Algirdas Brazauskas. He joined the Lithuanian Centre Union in 1993 and became its chairman until 2000. In 1996, he was elected to the Seimas and served until 2000. From 2003 to 2007 he chaired the National Centre Party (NCP), since renamed the Lithuanian Centre Party (LCP) in 2005. He was a winner of the Stasys Šalkauskis prize. Saulius Skvernelis (born 23 July 1970) is a Lithuanian politician who has been Prime Minister of Lithuania since 2016. He is also a member of the Seimas. Previously he served as police commissioner, and he was Minister of the Interior from 2014 to 2016. Vladas Mironas pronunciation (22 June 1880 in Kuodiškiai, Kovno Governorate – 18 February 1953 in Vladimir) was a Lithuanian priest, politician and later Prime Minister of Lithuania. In 1905, Mironas participated in the Great Vilnius Seimas and, in 1917, the Vilnius Conference. He was elected to the Council of Lithuania and became its second vice-chairman. Later he left politics and worked as a priest. After the coup d'état in 1926, he was elected to the 3rd Seimas, and after couple of years again returned to priesthood. 1938 he was offered to become the Prime Minister of Lithuania representing Lithuanian Nationalists Union. In 1941 he was arrested and imprisoned, being freed a few days later by the Lithuanian Activist Front. Arrested again in 1945, he was forced to collaborate with NKVD and worked in Vilnius. As his collaboration with NKVD proved not to be satisfactory, Mironas was arrested yet again in 1947 and subsequently sent to Vladimir Prison, where he died in 1953.